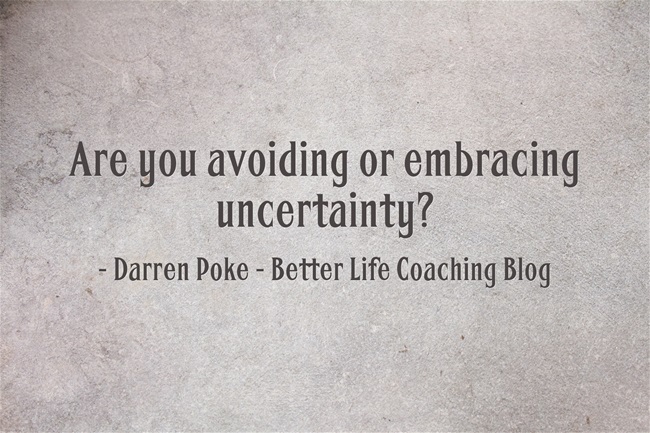 Are You Avoiding or Embracing Uncertainty? Uncertainty is one of the few things that we can be certain about in life. And whatever we do, we can never be absolutely sure about what the future holds. But uncertainty can be uncomfortable, so we try to avoid it. We try to find safe, secure jobs, even if they are mundane and meaningless. We try to control our relationships, even if that means we limit their potential. We only read books or blogs by people we already agree with (if we read at all), so that our worldview isn’t challenged. We go to the same holiday destination, the same restaurant and sit in the same seat on the bus. We prefer the guaranteed sale, the easy win, the life without surprises. But what if, instead of avoiding uncertainty, we embraced it? What if we chose a vocation that was more of an adventure than a job? What if we spent more time with people with different backgrounds, different religions, different political persuasions who could challenge us and cause us to think, change and grow? What if we understood that life is less about controlling the outcome and more about maximising it? What if we became less anxious about the future and more resilient during times of change? What if we replaced our fear of uncertainty with hope for a better, if unknown, future? What if we understood that we don’t need to see the whole staircase, we just need to take the next step? I honestly don’t know what the next day, week, month, or year will bring. Sometimes, that scares me and sometimes that excites me. My prayer today is that we each learn to embrace the uncertainty more and more as we endeavour to increase our influence, maximise our potential and live a life that’s worth living. Previous post – Can One Person Really Change the World? Ain’t it the truth? Good stuff, Darren! I agree that we should embrace uncertainty and live our lives to the fullest. « Can One Person Really Change the World?